If you read the title of this post and scratched your head wondering what I’m talking about, you’re probably not alone. I’m relatively new to Atlantic Beach Pie. If this sounds like you, then welcome! Here is a recipe where you can make your own. 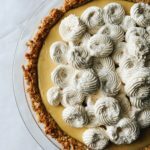 So what is an Atlantic Beach Pie? It’s a citrus pie with a cracker crust, typically saltine or even Ritz cracker. I’ve heard they are served in seafood places along the east coast. Okay, I admit the saltine cracker crust sounds weird. But supposedly, it’s an amazing pie, so I was dying to try it. The crust is made similarly to other cracker crusts in which you mix the cracker, sugar, and butter then bake before filling. I’m telling you, it’s so easy. I use a food processor to do it, but you don’t even need that. Just whip out a pair of man hands (Seinfeld reference) and start smashing the heck outta those crackers. You can also put them in a ziplock bag and smash ’em with a rolling pin. Either way works. Now to the filling. 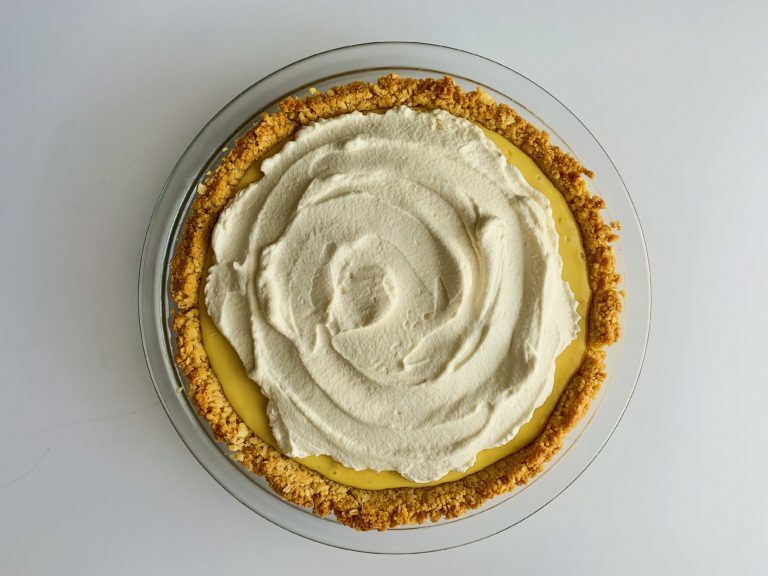 It starts similarly to my Key Lime Pie recipe, with egg yolks and sweetened condensed milk. 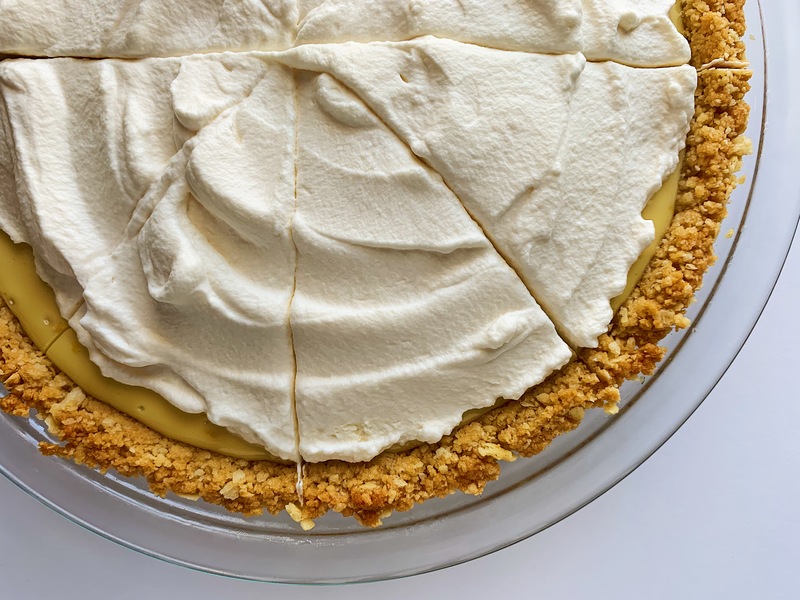 I really wanted to try Meyer lemons in this pie, and luckily I found some at my local market. But if you can’t find Meyer lemons, regular lemons will definitely work, too. Or even limes! Here’s a few tips for when you’re making the crust. First, make sure the crackers are ground pretty small and evenly. You won’t want them ground into a fine powder. I use about 6 ounces of crackers for this. In my box of Keebler Zesta crackers, it was a little less than a sleeve and a half. If you mix up all the crust ingredients and it looks like a paste instead of damp crumbs, then you’ll need to add more. The best tip I can give you: weigh your crackers! The cracker crust should look similarly to a wet graham cracker crust. After you dump the crust into your pie pan, use a flat-bottomed measuring cups to smooth it on the bottom and on the sides of the plate. This is the easiest method, I swear. I also use my finger to stop the crumbs from flying too far up the sides of the pie plate. If, after you have baked the pie, the crust has slid down or shrunk, just use the measuring cup to form it back into place. Be careful not to burn yourself! Once the crust is baked, all you have to do is fill the pie and bake for a few more minutes. Then it’s done! Well, you’ve got to chill it then whip some cream. Then after that, it’s done. I’m thinking Atlantic Beach Pie is going to be an awesome Easter dessert, what do you think? A bright and refreshing pie with a surprisingly tasty crust. Preheat your oven to 350 F. Lightly grease a 9 inch pie plate and set aside. Combine the crackers and salt in the bowl of a food processor. Pulse until the crackers are fine crumbs, about 15 times. Add melted butter and corn syrup then pulse 15 more times until the mixture is combined. Pour the mixture into the pie plate and press into an even layer and up the sides of the pie plate. A measuring cup really helps to do this. Place pie plate on a cookie sheet and bake for about 17 minutes or until the crust is a light golden brown. Remove from oven and set aside while you make the filling. Combine the sweetened condensed milk and egg yolks in a medium-sized bowl. Add lemon juice and lemon zest and mix well, making sure the juice is completely combined. Pour the filling into the warm pie crust and place back into the oven. Bake for an additional 15-17 minutes or until the edges are set but the middle jiggles slightly. Remove from the oven and place on a wire rack to cool completely. Carefully cover with plastic wrap (don't allow the plastic wrap to touch the surface of the pie, otherwise it will stick) and place in the fridge for at least four hours. Before serving, use a stand mixer or hand mixer to whip the cream to soft peaks. Add sugar and vanilla extract and continue to whip to stiff peaks. Spread over the tip of the pie and serve. Enjoy! When it comes to measuring the crackers, it's best to weigh them. One sleeve of crackers in weight may vary between manufacturers.